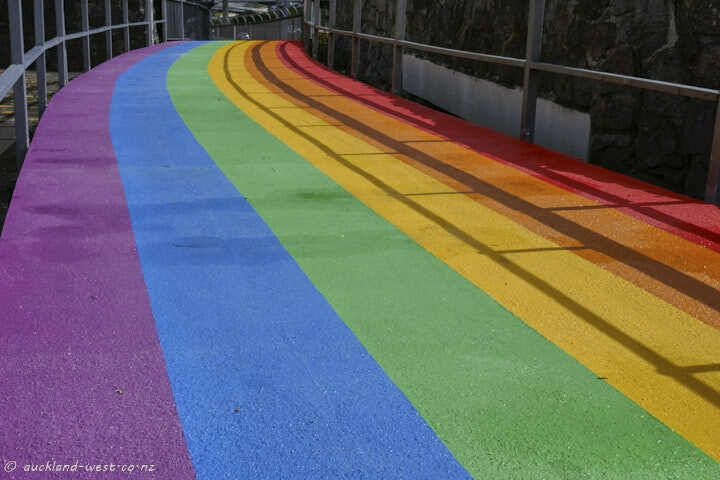 Some time ago, the Northwestern Cycleway received a coat of many colours for a short stretch from Unitec (Point Chevalier) towards the west. Nice and cheerful, even without a pot of gold. And it’s there, rain or shine! Near Eric Armishaw Reserve, Point Chevalier. 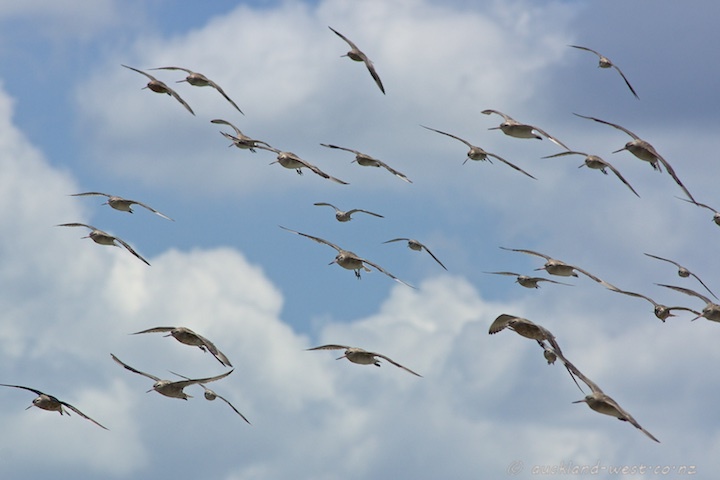 It won’t be long before these birds will migrate back to their breeding grounds in Alaska (knots go to Siberia). 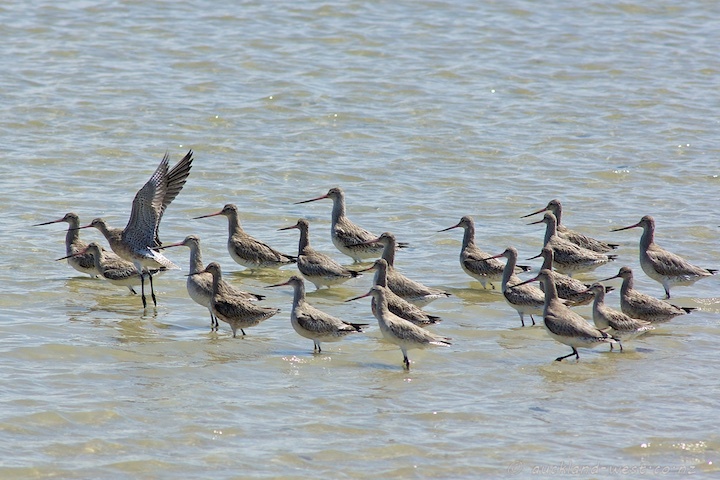 While the trip of the godwits from Alaska to NZ is done along the direct non-stop route over water, the return journey has less favorable winds and requires staging points in the Yellow Sea. A view of Auckland from Patiki Road, near State Highway 16. Mangroves in the foreground, then Point Chevalier and city skyline. Utility box on Carrington Road, near Unitec. Inscription on the side panel reads: ‘Bird with arms’ by Paul Walsh. This artwork was sponsored by Julia Wehner. 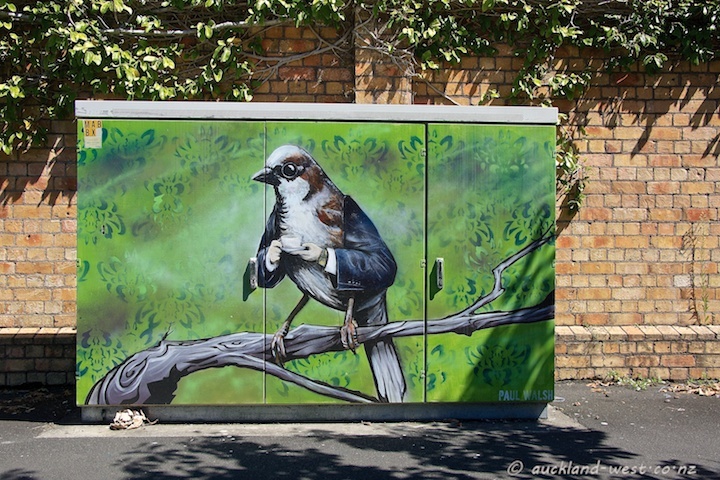 On poking around on the internet I found that in 2013, Paul Walsh ran a crowd funding project through pledge me for 10 utility boxes with a goal of NZ$350 (that’s $35 per box – what a bargain!). Not surprisingly, the target was reached on day 1, the total eventually reaching $1300, promised to yield even more boxes. The reward for a $35 subscription was “Your name in paint”: I will paint ‘this artwork funded by [your name]’ on the side of one of the exchange boxes, as well as sending you a signed sketch. Bam! 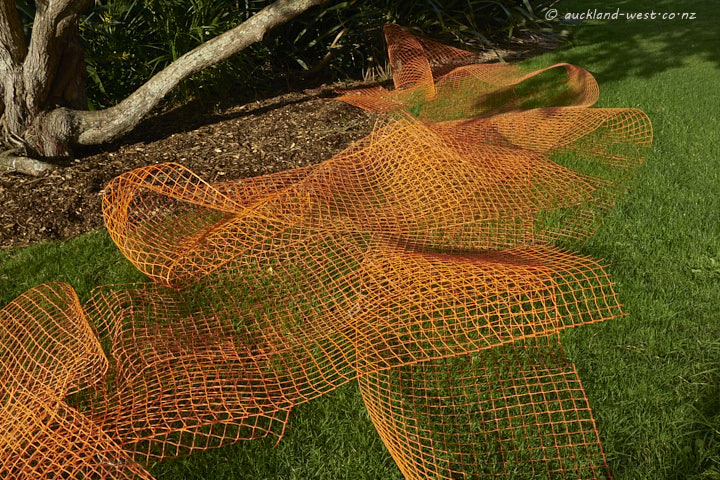 Now you’re funding public art like a millionaire! More murals on Oakland Daily Photos’ Monday Murals. 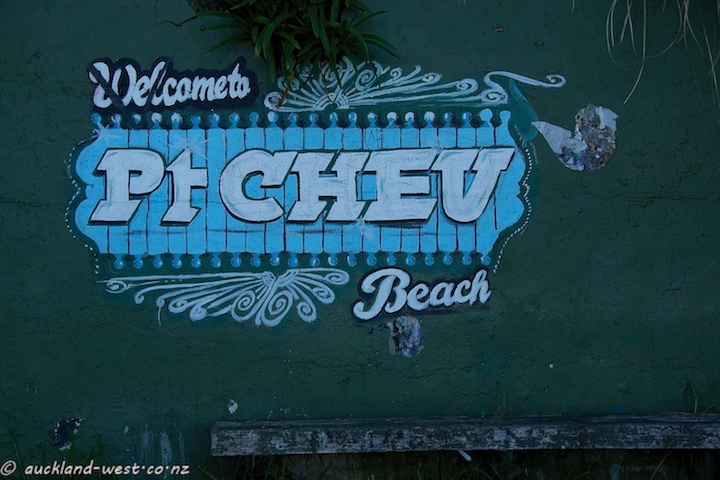 Not your typical roadside sign, this welcome faces the water near the northern end of Point Chevalier Beach. There is an inscription “Maryanne Papa ’89” (in the letter “V”), but the sign looks much more recent. This mural graces a house on Point Chevalier Road. 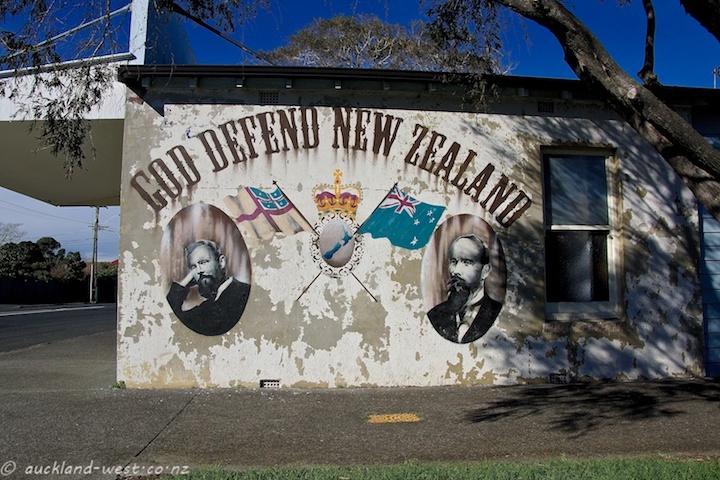 It was created for and used in a 2011 TV documentary by David Ferrier on the history of the New Zealand National Anthem (“God Defend New Zealand” – which replaced “God Save the Queen” in 1972). On the left is a portrait of John Joseph Woods, the composer of the tune, while Thomas Bracken, the author of the words, is on the right. The mural was created by the Cut Collective. The house is now a boutique for classy accoutrements, Two Daughters and Friends. Open 24/7 if you shop online, and a very select few hours if you wish to shop in person. Ending with a quote from the documentary: “The product of an Irishman’s song writing competition during the 1800s, judged by three German guys living in Australia!” The documentary (in several instalments) can be found here (hoping that it’s available outside NZ). And finally a youtube clip of our national anthem in sign language. 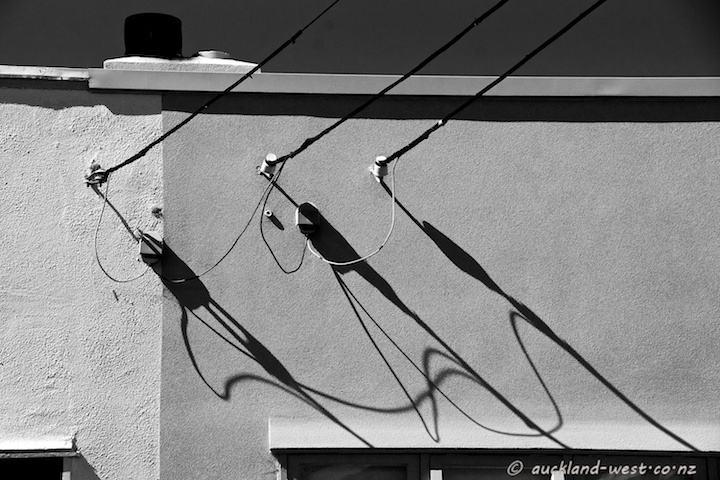 The sun is scrawling shadows over a wall. Point Chevalier. 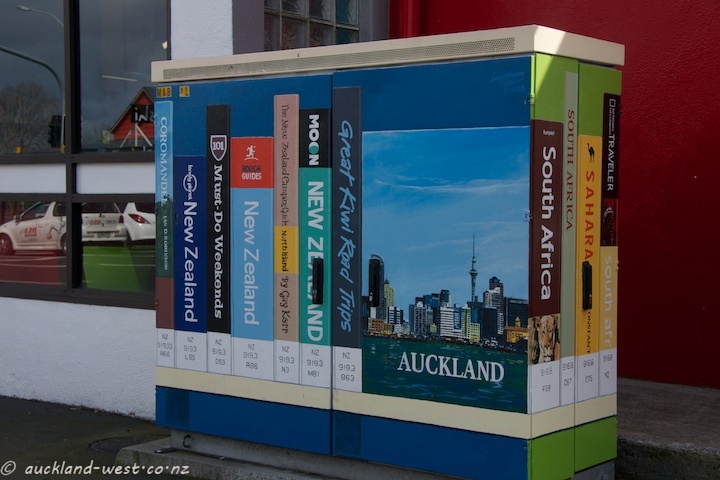 This roadside cabinet stands next to Point Chevalier Library, and depicts a selection of library books to guide you to places near and far. 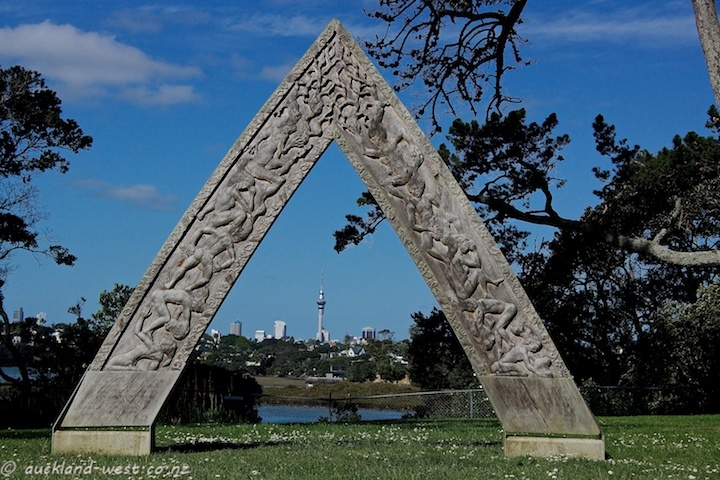 This arch, carved by Tim Codyre (2009) is found in Coyle Park, Point Chevalier. 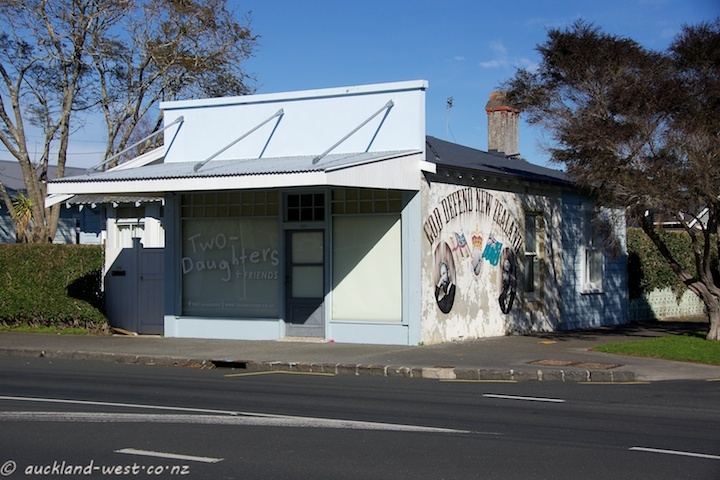 It tells the legend of Meola Reef, Te Toka Roa. 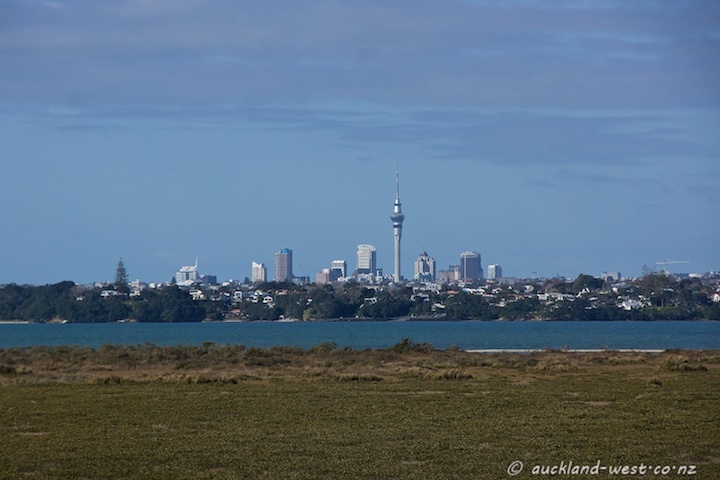 Auckland City with Sky Tower in the background, the mangroves of Meola Reef in mid ground. 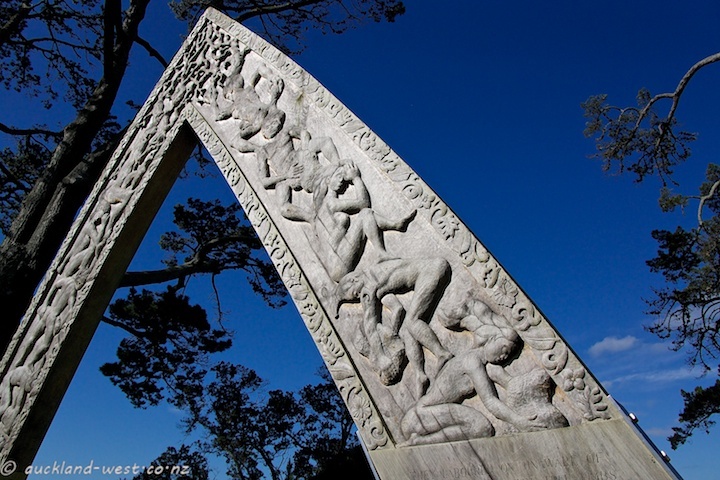 Patupaiarehe, fairy people, lived in the darkness of Waitakere bush. One night, on the shores of the Waitemata Harbour, two opposing groups were doing battle. The weaker ones tried to escape by building a stone causeway. They laboured on unaware of the rising sun. The tree limbs sticking out of the lava flow of the reef, Te Toka Roa, are said to be the bones of the Patupaiarehe fairy people, petrified by the sun.